He is a perfect yogi who, by comparison to his own self, sees the true equality of all beings, in both their happiness and their distress, O Arjuna! One who is Krsna conscious is a perfect yogi; he is aware of everyone’s happiness and distress by dint of his own personal experience. The cause of the distress of a living entity is forgetfulness of his relationship with God. And the cause of happiness is knowing Krsna to be the supreme enjoyer of all the activities of the human being, the proprietor of all lands and planets, and the sincerest friend of all living entities. The perfect yogi knows that the living being who is conditioned by the modes of material nature is subjected to the threefold material miseries due to forgetfulness of his relationship with Krsna. And because one in Krsna consciousness is happy, he tries to distribute the knowledge of Krsna everywhere. Since the perfect yogi tries to broadcast the importance of becoming Krsna conscious, he is the best philanthropist in the world, and he is the dearest servitor of the Lord. Na ca tasman manusyesu kascin me priya-krttamah (Bg. 18.69). In other words, a devotee of the Lord always looks to the welfare of all living entities, and in this way he is factually the friend of everyone. He is the best yogi because he does not desire perfection in yoga for his personal benefit, but tries for others also. He does not envy his fellow living entities. Here is a contrast between a pure devotee of the Lord and a yogi interested only in his personal elevation. The yogi who has withdrawn to a secluded place in order to meditate perfectly may not be as perfect as a devotee who is trying his best to turn every man toward Krsna consciousness. I’ve been finding myself talking a lot about Srila Prabhupada recently. My desire to speak more about him was probably stimulated in Mayapura when I read a booklet produced by a committee of our GBC body about Srila Prabhupada’s position as the Founder-Acarya of ISKCON. Essentially it was just a wonderful book that established, very conclusively, the meaning of “Founder-Acarya… not only based upon Srila Prabhupada’s position in ISKCON but also based upon the position of “Founder-Acarya” in our sampradaya. I was very enlivened after reading this booklet. I read it one day when I was sick and was unable to attend the meetings. It deepened my conviction about the importance of preserving Srila Prabhupada’s presence within the International Society for Krsna consciousness. The word “Acarya” in Founder-Acarya means that Srila Prabhupada is the ultimate teacher by his own example in ISKCON. Being a perfect teacher by example, therefore, everything he does is instructive because, as followers, we are meant to aspire to strictly follow his example. Prabhupada would oftentimes speak about the difference between following in the footsteps and imitating. He would say that following in the footsteps of the previous acaryas means that we follow the same path they themselves walked. It also means to follow their instructions. Therefore, mahajano yena gatah sa panthah….they leave behind instructions by which their followers can traverse the same path as they themselves also traversed. Imitating means that we try to artificially imitate the position of being fully realized without being fully realized. This is Krsna’s instruction in Bhagavad-gita. He explains why He had to also teach by setting an example because if He didn’t then the whole world would be put to ruination. Srila Prabhupada’s instructions were so potent because he did what he was preaching. In English, we have an expression, I don’t know if there is a comparable one in Russian, “He walks his talk.” In other words, his actions are fully consistent with his words. Because he was so elevated, he would sometimes give an instruction which would seem almost impossible to follow. But his example was always there as the extra strength for us to try. We all experienced that during Srila Prabhupada’s manifest presence in our Krsna consciousness movement. Srila Prabhupada was inspiring his followers to become ghostianandis, to preach Krsna consciousness, and not to become concerned simply about one’s own enlightenment. There was an overwhelming emphasis on spreading Krsna consciousness and there was an enthusiasm to do so because we always had his example. We may not be Krsna conscious, but we could always preach boldly and strongly that it exists because we could always point to Prabhupada. In one sense it was very simple in those early years because Prabhupada was not only our Founder-Acarya, but he was the only guru. When someone became qualified for initiation, they knew who they were going to be initiated by and who they were going to serve. That gave Srila Prabhupada’s followers great strength and conviction to preach his message. We felt Prabhupada was therefore us and was carefully watching to make sure we didn’t deviate. So we could repeat everything that Prabhupada told us and we always had the full confidence and support that the example was there for others to see. This gave us great strength to preach, and to preach boldly, because Srila Prabhupada always emphasized to preach boldly. He told us to “Boil the milk and make it thicker.” In other words, don’t compromise. Don’t water Krsna consciousness down to something it isn’t. Krsna is already all-attractive. Don’t ever water Krsna consciousness down. I was telling a story to a group of devotees in Kaliningrad the other day. I was remembering one conversation that Srila Prabhupada had… I can’t remember what year it was. I think it might have been 1975. He was visited by one well-known yogi at that time. His name was Yogi Bhajan. I never met Yogi Bhajan but in 1971, I was living with a group of people who were his followers. It was before I read Srila Prabhupada’s Bhagavad-gita. They used to speak a lot about him to me. But I had no particular appeal or attraction to him. Prabhupada said, “No. There’s only one goal. Krsna’s goal. We have to follow Krsna otherwise how can we become united?” Prabhupada used the example about the United Nations. He would say that the United Nations means that even though many countries come together, they have their own flag and they represent their own interests. Yhey are mainly interested in their own interests. That’s all. So he said that United Nations simply means that there are more flags. Therefore United Nations simply means that we add more flags but there’s no real unity because everyone is simply representing their own interests. They want to make sure that their own interests are being secured. But Yogi Bhajan was a little persistent because he felt that if Prabhupada attended more people would come. Prabhupada didn’t want to be used that way. Yogi Bhajan really tried to make it look really nice, “If you come, it will be so nice, so wonderful, it will be a real good example for the world. At that particular point, one of the people accompanying him got a little incensed, so they got up and they left. Prabhupada simply laughed. Someone may say, “Why didn’t Prabhupada take the opportunity to preach at the event?” Because he didn’t want to compromise Krsna consciousness. He was an uncompromised example of Krsna consciousness. There is another story I like about Prabhupada and his bold preaching. Prabhupada was invited in Jagannath Puri to inaugurate a book that one local author had written. Many famous people were there to do the inauguration. So Prabhupada saw this as a very good opportunity to preach boldly because he was very disturbed that his disciples were not being allowed to take darshan of Lord Jagannath. He therefore accepted the invitation although the organizers didn’t know that was Prabhupada’s intention. The organizers arranged for all the other invited guests to speak about the book first and then Prabhupada was to speak last. So one by one each dignitary came and spoke about the author’s book, glorified him, and said things about the book. Prabhupada was then invited to speak. So he was challenging, “Why are you not allowing Vaisnavas to take darshan of Lord Jagannath?” He spoke for some time and the organizers were starting to get a little anxious. They were standing on the side and were saying, “Swamiji, the book. Swamiji, the book!” Prabhupada didn’t even look at them. He continued like fire. “Swamiji, Swamiji, the book!” Prabhupada just waited until he finished his message. He then looked up at them and they said, “Swamiji, the book!” Prabhupada picked up the book and said, “Oh yes. This book is inaugurated” and then he threw it on the table and walked off the stage. Finished. So bold. He was so bold. He could be bold. Of course Prabhupada even sometimes said to us, he said, “I can do this because I’m an old man. Don’t imitate. Because he would be that way and people would still respect him and listen to him. He would caution us though. He wanted us to preach boldly but to be careful to not imitate. Prabhupada was also a gentleman. He would not publicly criticize. Even when people would ask Prabhupada, for example, if they would ask, “Can you tell me? What is your opinion of Yogi Bhajan?” And Prabhupada would say, “What is his philosophy?” So he would make the person explain what is the philosophy of Yogi Bhajan. I’m using him just as a hypothetical example. But he did it with many people because people would sometimes ask Prabhupada’s opinion about… at that time there was a lot… for instance there was Krsnamurti, who was very popular, Guru Maharaji, the so-called “perfect master”. Then there were so many gods around too. Prabhupada also had to deal with questions about all of these gods. So Prabhupada would ask, “What is his philosophy?” Upon hearing the philosophy he would then rip it to pieces. He would expose the impersonal conclusion or whatever misrepresentation of the absolute truth that it was. But he would not openly criticize the individual. He did this a lot with Vivekananda. Although he would not go out of his way to criticize publicly, but he would definitely do it in private conversations and lectures with disciples. If he was asked publicly he would have to defend Krsna. He was always defending Krsna. He was always defending the sampradaya. And then the man said, “But Swamiji, what do you do? You are simply repeating what somebody else said. What are you doing?” Of course, this is Prabhupada’s whole mission. Bhagavad-gita AS IT IS. That was his whole mission. His mission was to give Krsna’s instruction as Krsna gave it. Therefore he was presenting Krsna’s words, explaining what Krsna’s words were and then he was teaching by his own example how he would surrender to Krsna’s words. Therefore Prabhupada’s words had so much potency to change people because he didn’t compromise. He gave Krsna’s words and he taught by his example, being fully surrendered to Krsna. This was his compassion because he was fully realized in what is real happiness, and because he saw all living entities as parts and parcels of Krsna, he knew that the only thing that could make them happy is to connect them to Krsna. Isopanisad says, “One who always sees all living entities as spiritual sparks, in quality one with the Lord, becomes a true knower of things. What, then, can be illusion or anxiety for him?” Srila Prabhupada was never experiencing any material anxiety. He had only one anxiety and that was the sufferings of others. That was his anxiety. Why? Because he was satisfied. He had his connection with Krsna and therefore he didn’t need anything from anyone for himself. Thus, he could give Krsna unlimitedly to everyone without compromising. Therefore he was a perfect yogi who could see why others were suffering. He knew their source of suffering, as he says right here in this commentary, “the cause of distress of a living entity is forgetfulness of his relationship with God.” Prabhupada went right to the root cause. Someone may say, “Well, there’s so many other causes of distress. I could make a big, long list.” But Prabhupada would go right to the root— forgetfulness of one’s relationship with God— because as soon as one establishes a connection with the Supreme Lord… no more birth, no more death. Moreover, whatever distress they may experience in this life is just burning up whatever reactions were left from previous lives, thus finishing their connection with the material world. Isn’t that compassion? He felt that kind of compassion and that’s why he was so uncompromising. “How can I give them anything less than Krsna?” That was his love. That was his equality. That was his kindness. So he gave Krsna uncompromisingly, and he was very careful to preserve that same method of distribution for the future. He therefore taught his followers to give Krsna to others. And he also expected his followers for future generations to preserve his teachings and this example. So even though we may not be fully Krsna conscious, we still have to know what is the goal— the example that we want to come to ourselves? We cannot imitate complete Krsna consciousness. But at least we must try to come to that platform. And even though we cannot imitate Srila Prabhupada’s perfect, Krsna conscious vision of the world, we must keep his method of preaching intact by preserving what he’s given to us in its most potent form— in his books— without imposing any of our own interpretation. Every page of Bhagavad-gita as it is pure devotional service. Every page of Srimad Bhagavatam is pure devotional service. It’s not anything else. It’s pure devotional service… beginning, middle and end. Therefore those who are true followers of Srila Prabhupada will keep his message intact. We still have his example. We can still talk about it. We can still remember that example. We should know what that example is. Everyone should know Srila Prabhupada. If you don’t know Srila Prabhupada, you’re losing. He’s the perfect example. Otherwise, how do we know what platform to aspire for unless we have the perfect example? If we don’t know, we’ll start thinking, “Oh I could be like this, I could be like that.” No. He’s our Founder-Acarya for all time— not just for twelve years while he was present on the planet. He’s the Founder-Acarya of ISKCON for as long as ISKCON is present. Prabhupada was very, very strong on this point. Whenever he saw the slightest discrepancy in being presented without the title “Founder-Acarya”, he would immediately correct it. One time Srila Prabhupada came to the new BBT headquarters in Los Angeles and in the front there was a sign, “Bhaktivedanta Book Trust, His Divine Grace A.C. Bhaktivedanta Swami Prabhupada.” Prabhupada said, “Where is Founder-Acarya? Why is it not there?” Devotees were shocked. He wanted to make sure that “Founder-Acarya” was on everything. Why? Someone may think it was vanity. No. There was never any pride in Prabhupada. It was his compassion. He wanted to make sure his vision prevailed for the Krsna consciousness movement. Therefore Founder-Acarya had to be everywhere because he wanted to ensure that everyone would be led to Krsna’s lotus feet. That is the mission we experienced in his presence. We’d bring everyone to Prabhupada’s lotus feet because we were confident he was connecting them to Krsna. So we need that example. Yes. The goal is to find shelter at the lotus feet of Krsna, and the example of how to find shelter at the lotus feet of Krsna is in our Founder-Acarya. Srila Prabhupada’s books are the foundation of the Krsna consciousness movement. Nobody else’s books are as important as Prabhupada’s books. When people come to our temples they should immediately see only Prabhupada’s books… a grand display. We should be eager, excited, ecstatic, to introduce people to Srila Prabhupada’s books. Srila Prabhupada’s books change lives… not just during his manifest presence. They are still changing lives and will continue to change lives. There’s so many stories about how people’s lives have been changed by coming in contact with Prabhupada in his books. I like to tell this story. It’s a wonderful story. Quite some time back, I was visiting the temple in Montreal. During the visit, I was writing my Vyasa Puja offering to Srila Prabhupada. Usually we have a deadline in order for it to be published in the annual Vyasa Puja book and the deadline was the next day. So I was sitting in my room about to begin writing my Vyasa Puja offering. What oftentimes happens, however, whenever it comes to write a Vyasa Puja offering, I sit there and I go blank for a little while, thinking about what I am going to write. So I was just sitting, looking at the screen thinking, “Where to start?” Starting is usually the hardest part. Once I’m started I can get going. So I agreed. I went into the temple reception area and there was one man, probably in his 60’s. He introduced himself and asked if we could sit down. So I shook his hand and sat down. He then opened the Bhagavad-gita and started reading verses from it, and then he started talking again about Prabhupada. “He was such a beautiful person. I don’t know why I did not become his disciple.” He started to tell everything that he saw at the airport. He went on talking and talking and I was thinking, “I thought that I was going to answer some questions but there are no questions being asked. He just wants to talk.” So I just sat there and was just mystified listening to him. All of a sudden he said, “Oh, I think my wife is probably ready by now.” He had been talking for about forty-five minutes mostly about Prabhupada. He got up, went to the door and started to say good-bye. Then he said, “You know, my wife and I read Prabhupada Lilamrita every night together. She won’t read Bhagavad-gita. But I can get her to read Prabhupada Lilamrita. And every night we read about Prabhupada. He then started telling me the latest story he read from Prabhupada Lilamrta. This went on for about another ten to fifteen minutes as he stood by the door with his hand on door knob and the door half-opened. Then he said, “I really have to go now. It’s been nice talking with you”, and he left. I probably didn’t say more than five words. I looked at my watch and one hour passed. I was thinking, “Oh no. I lost my one hour!” I had a program coming up and therefore lost the hour I was hoping to use for writing my Vyasa Puja offering. 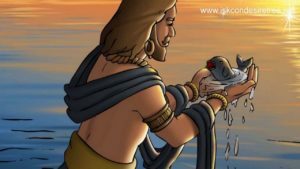 As it turned out, the next morning I sat down and just wrote the whole story about my meeting with the former Captain, and that was my Vyasa Puja offering. I saw how Krsna just sent him to write my Vyasa Puja offering for me because I couldn’t come up with anything myself. Anyway, my realization is that Prabhupada is still changing lives. That man was so attached to Prabhupada. It seemed to me that the gateway to the spiritual world will be open to him for the attachment he has to Krsna’s pure devotee. I could tell so many other stories but the point is that it’s so important to make Srila Prabhupada’s books available to people. People are hankering to know someone like Prabhupada and we have a responsibility, as his followers, to make sure that Prabhupada is always accessible to everyone. We should be carefrul to never eclipse Srila Prabhupada. For instance how do we make Krsna accessible? We make Krsna accessible by being Krsna conscious. That’s how Krsna becomes accessible. The more Krsna conscious we are the more people can make a connection with Krsna. We don’t make Krsna accessible by packaging Him in a way that people can’t see who Krsna is. We make Krsna accessible by the way Prabhupada made Krsna accessible. He spoke only about Krsna. That’s how Krsna became accessible. And he lived only for Krsna. That made Krsna even more accessible. So why shouldn’t we make Prabhupada accessible also? We should make him accessible by making sure that everybody has an opportunity to receive his books. Everybody should know what his example is. And everybody should know what his mission is. Krsna. Nothing more, nothing less. The lotus feet of Krsna. When you have the lotus feet of Krsna, you have everything. Prabhupada says, yasmin vijnate sarvam evam vijnatam bhavati. (Mundaka Upanisad 1.3) When you have Krsna, you have everything. That’s his mission. Therefore there’s nothing more than Krsna because there is nobody equal to Him and nobody is greater than Him. Krsna is the last stop, the param gatih, the final goal. And we have to establish that goal in the minds of everyone. Prabhupada therefore emphasized that there is nothing more than Krsna. And he would never give anything less than Krsna. Uncompromising. Nothing less. That was his compassion. That was his kindness to humanity. Anyone who came in contact with him could feel his compassion. Simply seeing him, tears would come to people’s eyes because he was so filled with compassion. Prabhupada would cry, simply to think how people were trying to forget Krsna. A devotee once told me a story about Srila Prabhupada. Prabhupada was in a car with devotees, driving by a golf course. When he saw the golfers he asked, “What are they doing?” He had never seen or heard of golf before. The devotee replied, “Prabhupada, that’s called golf.” Prabhupada asked, “What is this golf?” The devotee said, “You see that stick there they are holding? They walk around all day and push a little white ball into a hole.” Prabhupada started to cry, big tears. “They are doing so much to try to forget Krsna.” Crying. Para dukha dukhi. That is a Vaisnava. A Vaisnava has that feeling in his heart. He has his connection with Krsna and therefore has everything he needs. He has service to Krsna. There’s a purpose for living for him. There’s a purpose for everything he does… for eating, for breathing. He never hankers. He’s satisfied in any condition of life. And because he does not suffer, he can feel other’s suffering. In this way a person who is self-satisfied and freed from envy can think of others’ welfare. Therefore when he sees others forgetting Krsna, he cries. He feels the pain that they won’t be happy until they are connected with Krsna. That’s what drove Prabhupada to expand the Krsna consciousness movement in the way he did within twelve years. He was sleeping two hours a night and waking up at midnight. He was translating Srimad Bhagavatam until four o’clock in the morning. He would then begin his day, go for his morning walk, give Srimad Bhagavatam class. Even during his morning walk he was preaching to his disciples. Then he would meet people. Everything he did, he did with the burning desire to give Krsna to others. Prabhupada is driving us to understand that principle. And if we don’t remember Prabhupada and remember his example, we’ll so easily forget. We’ll think his mission is to become comfortable in life. Prabhupada didn’t teach that, because he never looked for his own comfort. He never tried. Comfort was offered but he was not interested. He taught how to use all of our energy for spreading Krsna consciousness. He never asked for his own comfort. Sometimes devotees would give comforts to him. We gave a lecture on Sunday explaining why Prabhupada would sometimes accept it. He accepted only out of compassion. Not because he was interested in his own comfort. He accepted it because he wanted to reciprocate the love of his disciples and take that love and place it to Krsna’s lotus feet. But he would never ask for his own comfort. His example was to not be interested in one’s own personal comfort. His comfort was giving Krsna to others. That was comfort for his heart because he felt he was using his energy for the hightest purpose. This is what’s in Srila Prabhupada’s purport. When we read Srila Prabhupada’s commentaries, these are the realizations we should be getting. He called his commentaries his personal ecstasies. Prabhupada was even one time sitting and reading his own book. When the Fifth Canto of Srimad Bhagavatam was brought to him, Prabhupada immediately opened it and began reading it. Devotees said, Prabhupada even you read your own books.” And Prabhupada said, “Oh yes. I have not written these books. Krsna has written these books. That’s why I am reading them. This is Prabhupada. Krsna on every page. Prabhupada knows how to make others really happy and he knows what the cause of distress is. Just one very simple point. We’ve simply forgotten Krsna. That is the source of distress.